This is Tina. How are you? I'm writing to follow-up my last invitation letter as below, would you please give a tentative reply? Thank you very much. 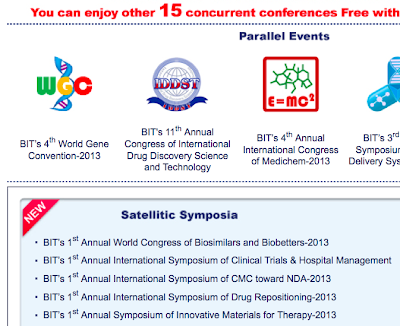 We are pleased to announce that the 3rd World Congress of Molecular Medicine (MolMed-2013) will be held during November 13th to 16th, 2013 in Haikou, China. On behalf of the organizing committee, we sincerely hope you could attend our congress and give a speech at the session, with your special contribution on your research area. We believe MolMed-2013, which has been endorsed by Haikou Convention Bureau, will be the perfect opportunity and platform to highlight the high profile permanent biotech convention! Haikou is world-famous for its unique and charming tropical views, relaxed and happy natural environment. As a capital of Hainan Province, Haikou gathers all what are famous in Hainan. Especially in the old Haikou, the building’s style mixed with Portuguese, French and Southeast Asian style. These streets used to be divided into areas for medicine, silk and clothing, agricultural products, stationery, etc. Hainan boasts for its rich and souvenirs as a paradise for tourists. Would you please indicate if your schedule is available during that time?